Fayette County resident Steve Bihl has his blood pressure checked by Holly Johnson, R.N., at the Fayette County Health Department. The American Heart Association states that heart disease is the leading cause of death for men and women in the United States. Every year, one in four deaths are caused by heart disease. But the good news? Heart disease can often be prevented when people make healthy choices and manage their health conditions. You can make healthy changes to lower your risk of developing heart disease. To lower your risk, watch your weight, quit smoking and stay away from secondhand smoke, control your cholesterol and blood pressure, drink alcohol (if you drink) only in moderation and get active and eat healthy. The Fayette County Health Department wants the community to know they are open from 8 a.m. to 5 p.m. for blood pressure checks, no appointment is needed. They can also do cholesterol checks but you do need to call and make an appointment for that. They are done the first two Tuesdays of the month in the AM and you do need to fast for that test. There is no charge. If you have been trying to lose weight and need some extra encouragement and ideas on how to eat right, you may attend the Fayette Fat Fighters on Monday evenings. Weigh-in is from 5 to 5:30 p.m. and the motivational, educational class is from 5:30 to 6 p.m. The class involves ideas on how to eat right and shop for healthy foods. Fayette Fat Fighters does not encourage going on diets because people can restrain themselves for so long and then go back to eating their old ways and therefore gain their weight back. So in this class you are learning to change your lifestyle by eating healthier, moving more and drinking more water. There are taste tests at times, lots of discussion, variety of games, education and support! There is no charge for this class and people are successfully losing weight! So if you are tired of losing and gaining, losing and gaining, please call the Fayette County Health Department and ask to speak to Jeannie Bihl if you have questions. 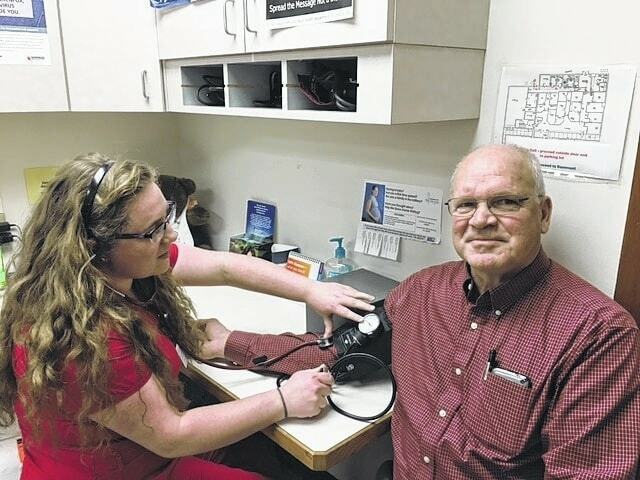 https://www.recordherald.com/wp-content/uploads/sites/27/2017/02/web1_bp-picture-2.jpgFayette County resident Steve Bihl has his blood pressure checked by Holly Johnson, R.N., at the Fayette County Health Department. The Fayette County Health Department is located at 317 S. Fayette Street in Washington C.H. and can be reached by telephone at 740-335-5910.